Veteran winger Joel Monaghan is enjoying being back in Castleford Tigers’ side, but admits it may only be temporary. Monaghan, 34, replaced the injured Greg Minikin against Catalans Dragons last week and marked his return with a spectacular try. He is set to continue in the team at home to Huddersfield Giants tonight, but Minikin - who has touched down nine times this year and is Betfred Super League’s second-top scorer, one try behind teammate Greg Eden - could be available for next Thursday’s trip to Wigan Warriors. Monaghan admitted is has been hard having to watch from the sidelines, but insisted: “I am coming to the end of my career and the quality of the young kids we’ve got in the team makes it a bit easier, when you are seeing probably future England centres and wingers ahead of you. Monaghan is enjoying being able to pass on his experience to the new generation. “Greg Minikin is not a natural winger,” he said. “I have spoken to him at training about a few things, but the strength he’s got for a young fella is unbelievable. 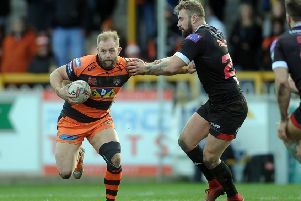 A victory tonight could strengthen Tigers’ hold on Super League’s top spot and Monaghan reckons they need to build on the resilience they showed last week, while improving in defence. “We were 14-0 behind and they had a fair bit go their way at the start, but I thought we showed a lot of guts to turn that around and be leading into half-time,” he said of the win five days ago. “Huddersfield have got some dangerous players across the park, they’ve got some big forwards and some quality outside-backs. Being in pole position brings new pressure, but Monaghan insisted: “I think we can handle that. “The style we play, we can score points from anywhere. There’s a few people been talking about the club, but we can’t buy into that.